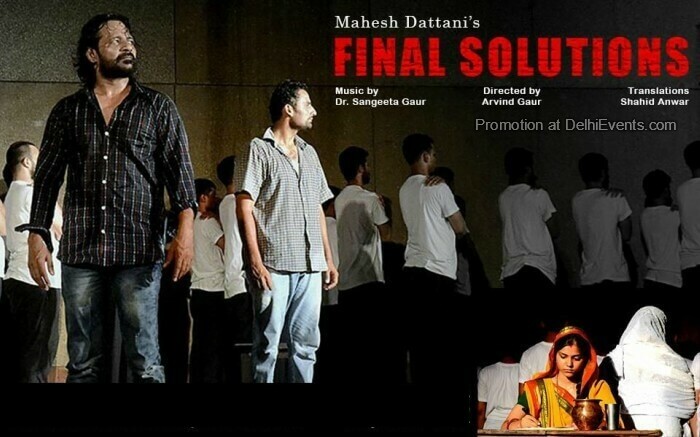 Final Solution has a powerful contemporary resonance as it addresses as issue of utmost concern to our society, i.e. the issue of communalism.The play presents different shades of the communalist attitude prevalent among Hindus and Muslims in its attempt to underline the stereotypes and cliches influencing the collective sensibility of one community against another. What distinguishes this work from other plays written on the subject is that it is neither sentimental in its appeal nor simplified in its approach. It advances the objective candour or a social scientist while presenting a mosaic of diverse attitudes towards religious identity that often plunges the country into inhuman strife. Yet the issue is not moralized, as the demons of communal hatred are located not out on the street but deep within us.